Can you please tell roape.net something about yourself? Your early politicisation and activism in Nigeria. I was born in Ikere Ekiti in the Western part of Nigeria into a middle class, polygamous family. My father was a cocoa farmer and produce buyer. He was also a politician by vocation. I started my schooling aged six and attended the Local Authority Primary School and African Church Comprehensive High School, Ikere Ekiti. I worked after leaving school, in 1977, with the then Ondo State Military Governor’s Office and the newly established Federal Government agency, the Public Complaints Commission which fulfilled the role of an ombudsman. It was at this time that I became politically conscious. I had the advantage of being able to read almost all the daily papers as I stayed with an uncle who headed the Ondo State Ministry of Justice (and was later a high court judge). He usually brought home all the day’s newspapers. As the result of the delay to my high school examination – West Africa School Certificate (WASC) – due to examination malpractices, I was very curious for any news related to the scam and the proceedings of the judicial commission that was instituted to investigate it. The period was also characterized by the political transition to the civilian second republic in 1979. All these events I followed through my readings of the papers. I hardly missed any of the political campaigns taking place at the time. I later received admission to the Polytechnic Ibadan for a two-year diploma course in Insurance from 1980 to 1982. Apart from the reputation of the school for producing professionals in various fields, the Polytechnic was also notable for its political inclination. I joined the student Marxist-Socialist Youth Movement (MSYM) immediately when I enrolled. The organisation was an affiliate of the Comrade Ola Oni-led Socialist Working Peoples Party (SWP) based in the town. The group had sought for registration in 1979 in order to participate in the elections, but was not registered despite its mass following. Ola Oni was instrumental in my ridding myself of illusions in Chief Obafemi Awolowo and his welfarist oriented party. Ola Oni was very critical of this leading politician as a hurdle on the path to building a revolutionary movement. Can you speak more broadly about the Nigerian radical left in the 1970s and your political involvement? On finishing at the Polytechnic, I got a job in an insurance company in Ibadan and this gave me the opportunity to participate in the activities of Socialist Working Peoples Party (SWP) beyond the campus. After three years at the company, I was sacked for unionising the company. When the SWP got to know about my plight a discussion was held with me to persuade me to serve as the administrative officer of the organisation. I worked directly under the supervision of Comrade Ola Oni for the next two years. I then proceeded to the University of Jos to study sociology in 1988. My decision to go as far as Jos, was due to information I received from a friend that it was one of the two departments of sociology where Marxist sociology was predominant, the other was Ahmadu Bello University, Zaria. Once I arrived in Jos I found this was true as most of the lecturers were socialist inclined. Before I left Ibadan, there had been a robust debate within the SWP that ultimately led to the break of the organisation along two trends of Trotskyism and non-Trotskyism. In fact it was on an earlier visit to Jos that I made my mind ultimately for Trotskyism based on my readings in the Jos City library. I worked throughout my student days at the University of Jos on the side of the Trotskyites. I therefore brought the SWP to Jos and to the entire north while working within Movement for the Advancement of African Society (MAAS). I met the MAAS on the ground when I started as a student at the University of Jos. Jos had no revolutionary tradition of note compared to Ibadan, but MAAS later became one of the most vibrant student groups. The organization organized public programmes such as workshops and public lectures to raise the political consciousness of the mass of the students. Youth-Students Solidarity Against Apartheid South Africa was to serve as the public front of the organization addressing such issues as apartheid in South Africa and other contemporary issues in Africa. Both organizations became mass organizations. The school also hosted the National Association of Nigerian Students national secretariat in 1991. The campaign for Academic Reform was led successfully by the Marxist students on campus. I became a victim of the struggle, like other Marxist students, except that I was the only final year student expelled at the time and my project was marked as a resit. The leaders of the movement in Jos, including myself, were also charged by a Miscellaneous Offence Tribunal for allegedly committing arson. 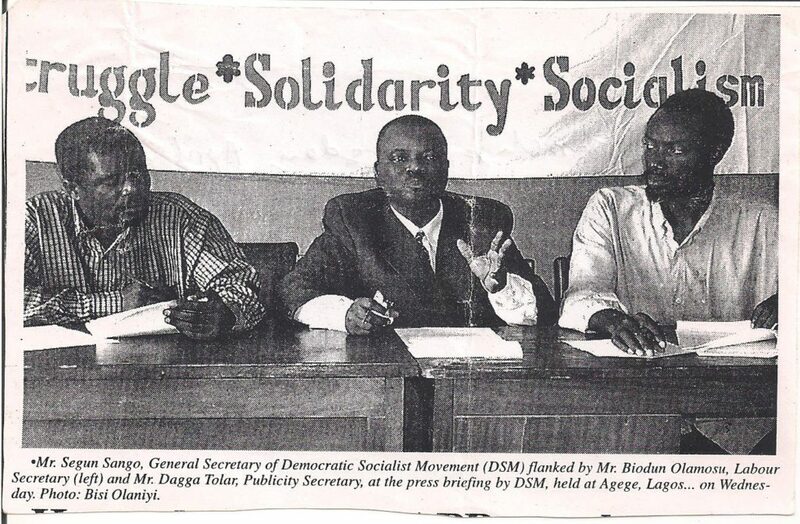 The Lagos Branch of the SWP had transformed in to an organization referred to by the paper’s name – Labour Militant – which was linked to the British organisation of the same name. After graduation, and on finishing a compulsory national youth service programme in May 1993, I became the full-time organizer of the organisation for the North of Nigeria for the whole of 1990s. At another time, the workers I was organizing in Coca-Cola were caught with campaign materials against the Ibrahim Babangida military junta. This regime did not want to leave office and shifted the transition timetable three times. The workers, including the union chairperson, Comrade Tukura, were taken to the Airforce headquarters in Makurdi, Benue State, where they were detained for weeks. The June 12 Movement in 1993 arose from the annulment of the presidential elections on that date. This struggle was to last for seven years, during which time, I worked on the platform of both Labour Militant and the National Conscience Party – including United Action for Democracy and Joint Action Committee of Nigeria (JACON) – fighting to put an end to military rule. I was arrested and detained on three occasions with some other activists and friends at different times in Kano and Ibadan. I eventually resigned from the Executive Council of Labour Militant in 2000 and left the organisation. I became the National Administrative Secretary of the mass based National Conscience Party in 2001 and formed the Socialist League together with Comrade Femi Aborisade in the same year. JACON was a collective of pro-democracy groups – including the NCP- to maximize pressure on the ruling class and international community. The left faction of this organization refused to participate in Abdulsallam Abubakar’s transition after the death of the military dictator Sani Abacha. We only participated in electoral politics four years later when civilian rule was already in place. I was the national administrative secretary of the NCP during the process of registration of the party with the Independent National Electoral Commission in 2003. I also contested as the deputy governorship candidate on the platform of the party in Oyo State in the same year. What did you do after 2003 and your campaign for the NCP? From 2003 to 2011 I worked as an organizer, researcher and administrator in the distributive and banking unions. I ultimately held the position of deputy secretary general. I also led the Socialist League until its merger to form the Socialist Workers League and served as the editor of its paper, Socialist Worker. My present work is in the area of research as I serve as the senior researcher and coordinator of the Centre for Social Policy and Labour Research. This organisation is developing a database on labour related matters and conducts research, education and training on labour rights and other labour related developmental policies. Political education is central in the work of the organization and we organize study groups with workers and other working people in the factories, communities and schools. We have been able to carry out many research works that remain to be published. Historically how would you chart the development of the Nigeria labour movement? The origin of the organised labour movement in Nigeria can be traced back to 1897 when the first reported workers’ strike took place in Lagos. Trade unions did not emerge officially until the formation of Civil Service Workers’ Union in 1912. 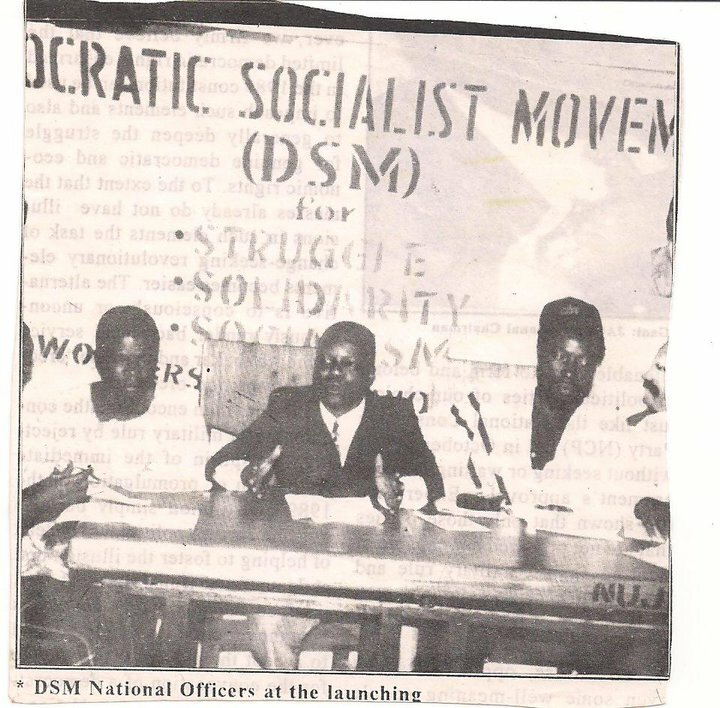 The left in the Nigerian labour movement first developed in the 1930s. This corresponded with the period of global economic crisis which was noted for appalling working conditions with real wages lagging behind inflation. On top of this was the racial discrimination by the colonial ruling class against black workers. Austerity measures were imposed by the government. The 1945 workers’ agitation demanding a cost of living allowance (COLA) was to wake up the government over the increase in inflation. Even when the home government in Britain acceded to this demand, blacks in the employment were excluded while their white counterparts were paid. Their demand was only met later after the strike. Such events as this further radicalised the movement and ultimately caused a break from the existing conservative union and labour centres and this resulted in militant workers forming their own unions. Also the Second World War was another factor in the radicalization of politics and the labour movement. Many black soldiers were recruited from Nigeria and this exposed them to the politics overseas. This included the nationalist struggle for self-determination and socialism in other parts of the world. Some were also influenced by the socialist ideology of left oriented soldiers from Europe. Mokwugo Okoye was a typical example. He became a moving force of the Zikist Movement on returning from the war and took the nationalist struggle to greater heights. Left politics led the decolonization struggle in Nigeria. The way and manner in which this force subsumed itself into the National Council of Nigeria and the Cameroons (NCNC) led by the educated elite and nationalist politicians, cannot be dissociated from the politics of international diplomacy played by the former Soviet Union in negotiations with Britain in the course of the war. Many labour activists in Nigeria looked up to the Soviet Union as a country to emulate. So its leaders had great influence and persuaded their supporters in Nigeria to follow the path of nationalism rather than a more revolutionary path. The tragedy of the movement could be seen later when the Socialist Party of Workers and Farmers was formed in 1963 and a split came a year later with the emergence of a Labour Party. The 1964 general strike for an increase in the minimum wage was led by the Joint Action Committee (JAC). This was an expression of the vibrancy of the Nigerian labour movement as the various factions of the movement came together when it mattered most to fight a common enemy. However, the military came to divide the movement along ethnic lines supporting the warring factions of the Civil War of 1967-1970. University students became the heroes of radical politics in the 1970s and 1980s. In 1981, labour opened the decade with a general strike demanding a 120 naira per month minimum wage. Other mass protests included anti-SAP protests – from 1986 – and the rage against the hike in the price of oil. Political movements for regime change and an end to military rule pervaded the 1990s. Over the last decade and a half since the end of military rule, the labour movement has been involved in trying to address the devastating effects of neoliberal policies on the working people. 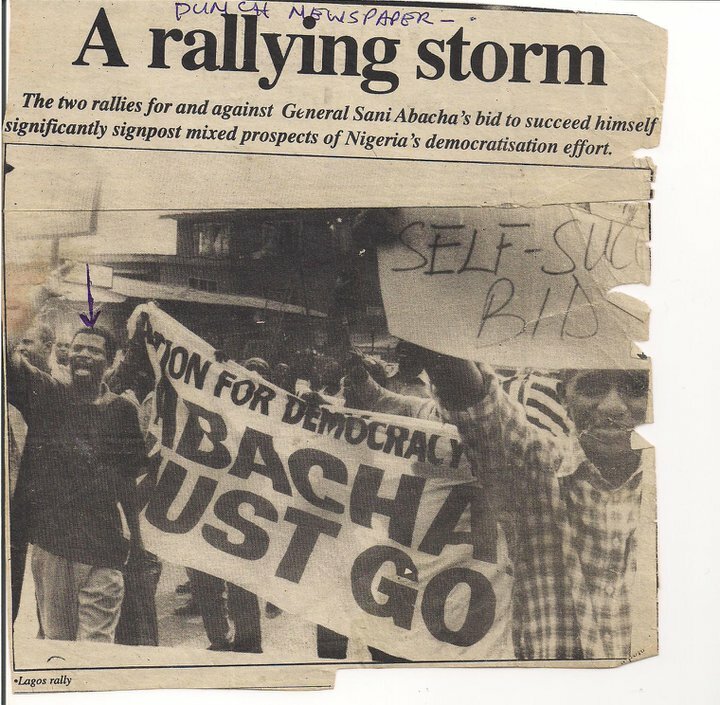 Abiodun Olamosu during the June 12 struggle when the pro-democracy movement organised a two million strong march in Lagos within days of hearing that the pro-Abacha groups would hold a one million rally in Abuja (published in the newspaper Punch). The current challenges facing the labour movement and the leftists in Nigeria include the policy of privatization and commercialization that make it difficult to fight against retrenchment, restructuring and the downsizing of workers. This raises the issue of the proper role for working class organisations in challenging the ruling class politically, as well as through the trade union ‘economic’ struggles. The labour bureaucrats are resisting playing a leading role as they see this as a threat to their privileged positions. The era of globalization is also noted for de-unionisation and weakening of working class solidarity. In 2015 a new government was elected to much international fanfare. The previous military leader, now president, Muhammadu Buhari promised reforms and an anti-corruption drive. Can you describe the period? The changes taking place in Nigeria can be understood from the perspective of the absence of working class alternatives, but those previously in power also failed and therefore totally lost out in the reckoning of the people. This explains why a new group of the ruling class was given the opportunity to rule. Muhammadu Buhari fits perfectly well into such a vacuum, as there was an illusion in him, by certain sections of the Nigerian populace, for his character and anti-corruption stand. How he will be able to meet up with his promise of reforming capitalism in the face of challenges facing the people is yet to be seen. His anti-imperialist posturing is now being questioned due to his withdrawal of the oil subsidy, devaluation and support for privatisation and liberalization of the economy. If I can speak a little more generally and theoretically; reforms of capitalism are not a new phenomenon in our political economic history. What differentiates socialists from reformists is that the latter believe in reform as an end in itself especially in order to avoid revolution from below. In contrast, socialists see reforms as a means to an end. We believe that the only lasting reform will be achieved with socialist revolution – all other reforms are eventually clawed back. Reforms are usually only available during periods of economic boom when enough wealth is available to carry out welfare programmes. So it might be difficult for the present government to achieve its promised reforms in a period of recession, whatever might be its intention. In a situation where the economy is in a shambles and has been handed over to market forces, it would be a fantasy to expect that any kind of reform could be carried out successfully. How would you characterise the challenges in Nigeria today for a radical political and economic alternative? The blows of neo-liberalism weakened the labour movement in the course of rationalising the workforce. Trade unions was made voluntary by law, so workers were no longer automatically made members of a union with compulsory check-off dues. Also we saw state interference in the affairs of the union. This reached its climax when the state dissolved the Nigerian Labour Congress, and affiliated unions, NUPENG, PENGASSAN, NUNS, NANS, and terminated the appointment of Academic Staff Union of Universities presidents and other leaders for their role in their union activities. Generally, neoliberalism wildly increased poverty of working people, for this reason many turned to forms of corruption as a coping strategy rather than the revolutionary path. Until 1999, the military dominated the political space. The failure of the system is responsible for the growth of ethnic-religious nationalism such as militant groups in the oil producing Niger Delta and Islamic groups like Boko Haram insurgents in the North East. 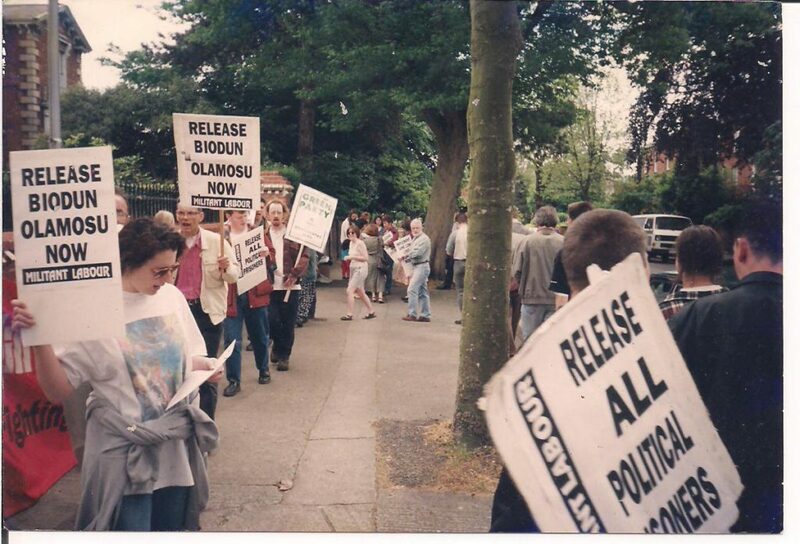 Solidarity demonstration in London during the Abacha military junta in the early 1990s, when Abiodun Olamosu was being detained in Nigeria. The way the country is structured and organised by capitalism is largely responsible for the attendant perennial problems that seem to defy solution – politically this has been described as ‘pipeline politics’ by the American scholar Michael Watts. The poor are the victims of the problems highlighted above as the ruling elites are not affected, but beneficiaries, despite their rhetoric of trying to associate with the poor. This is the very reason that the working class alternative is the solution to the ruling agenda that has failed us over the years. There is, therefore, the need to develop a real pro-poor alternative in the arena of mainstream electoral politics, and for the working class to mobilise even if only to measure their numerical strength. A well-organised party of the popular classes has ample chances of winning an election, as the ruling parties have shown over time their incapability to rule. The cause of struggle and solidarity with others will go a long way to foster unity among the working people. The ongoing economic recession resulting from overproduction of oil poses a clear case of the problem of international capitalism. So the solution should be sought from this premise. This explains why we are canvassing for a system of common ownership of the means of production that will be democratically controlled and managed from below. The history of the Nigerian left and Marxist scholarship in the country has recently been the focus of a new book. Adam Mayer’s Naija Marxisms: Revolutionary Thought in Nigeria which was reviewed by roape.net last year, is an important volume in this discussion of the left. What’s your assessment of the book and the history it describes? The book is a welcome contribution on the Nigerian left and its contribution to Marxism. It can best be described as a compendium. Nevertheless, I would have expected the author to look at the contributions of Marxists in Nigeria from the point of view of the various Marxist organisations that existed. So, for example, we have great Marxists contributions coming various organisations, across different traditions. It is only by doing this can we avoid lionising the “legal Marxists” as representing all Nigerian Marxists. For instance the author singled out Nkenna Nzimiro as the only Marxist anthropologist in the country while referring to Nzimiro’s PhD thesis which was devoid of class analysis. So the question to ask is: where does he place Omafume Onoge, an activist and social-anthropologist, whose PhD thesis was on Aiyetoro “communist” community in the present Ondo State. As important as the book is, there are gaps that have to noted and acknowledged. 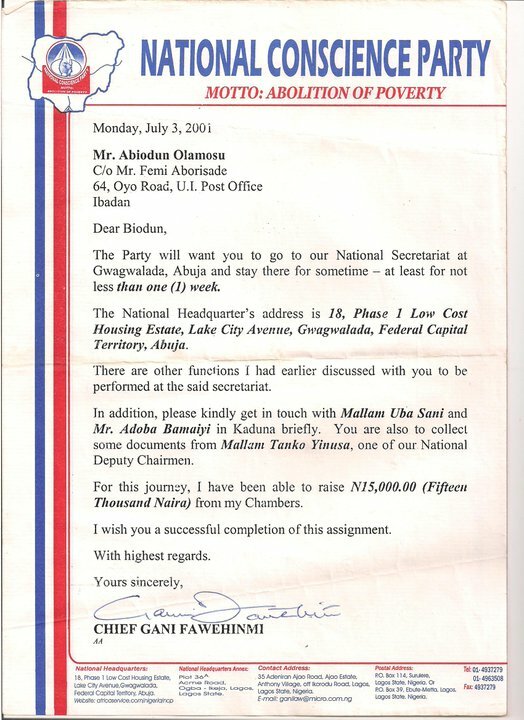 Letter signed by NCP leader Chief Gani Fawehinmi, asking Abiodun Olamosu to oversee the affairs of the party at the HQ, Abuja. The book also gets it wrong in putting the blame for not being ‘revolutionary enough’ on some of the independent African countries that held allegiance to former Soviet Union. Yet the reason for this was the Stalinist stronghold on the policies of these independent left-leaning states and its leaders. In reality they worked as a break on the emergence of independent working class politics in these countries – as these movements were blocked, or suppressed in the former Soviet Union and Eastern Europe. The degeneration of the former Soviet Union in the years after 1917 meant that the country did not tolerate independent socialist and revolutionary movements that would not be subservient to its dictates and could not be controlled. And this was also the very reason they tolerated both the state and labour movement, including bureaucratic Nigerian labour leaders, who betrayed the working class as long as ‘diplomatic interests’ were being served. However, Mayer’s book is a valuable and important volume that will serve to educate people on the rich and varied tradition of Nigerian Marxism. How would you describe the weaknesses of the revolutionary and radical left in Nigeria, despite a militant working class, and a rich tradition of Marxist politics? Also can you say something about the influence of the region and the continent on left politics in Nigeria? The reasons are complex. A great number of the revolutionary left were drawn from the universities across the country as students and teachers, some of them embraced the ideas of Marxism in their scholarship for career purposes rather than for its revolutionary politics. This was partly because Marxist scholarship had been made popular by its pioneers such as Ola Oni. Another factor was the influence of the various ‘camps’, Stalinist Russia, China, North Korea, Cuba, etc, with groups and activists receiving financial assistance from these sources and seeking their patronage. In addition the opportunism in the leadership of the left which did not allow for internal democracy in the conduct of the affairs of the movements and parties. Also the tendency of trade union leaders to look to themselves, rather than the rank and file, caused serious harm to the movement. Union leaders are petty-bourgeois in orientation, their connection to the state and authorities cripples our struggles, and their privileged position within the labour movement distances them from the realities of working class life and struggles. Turning specifically to Africa, during the Nkrumah-era in Africa, despite the fact that his arch enemies were the Nigerian ruling class, he garnered substantial following among the revolutionary left for his pan-Africanist ideas. This had an influence on us. Also, in respect of South Africa, where the support and solidarity for their struggles came from the revolutionary movement here, as I have already indicated. Returning to the weaknesses of the left, we have to step back more than two decades. Despite the limitation of Stalinist Russia and other state-capitalist countries in the East, they were still a source of hope to many working people. So this accounts, in large part, for the collapse of left movements in Nigeria and internationally when these regimes crumbled – you’ll remember that most socialists thought an end had come to the left internationally in the early 1990s. One can also mention the orientation of left parties who saw building movement from above as a solution, rather than the ones that would involve the rank and file fighting from below. From these weakness comes the challenges for the Nigerian left today. Abiodun Olamosu is a leading Marxist activist in Nigeria and the Senior Researcher and Coordinator of the Centre for Social Policy and Labour Research. A critical interview with a Marxist revolutionary who remains strong and undeterred in his socialist belief. Thank you for this fantastic interview roape.net and thanks also for the wealth of information and depth of insight that Comrade Olamosu has given us through this interview!! I also feel honoured that Comrade Olamosu thinks highly of my book, Naija Marxisms (Pluto Press, 2016), calling it ‘an important volume.’ It was indeed not accidental that the book came to resemble a compendium — I was tempted originally even to put together a ‘reader’ instead of a regular monograph, I was so fascinated by the richness of the original works of Marxist political theory done by Nigerian authors. –To tell the truth, Omafume Onoge’s PhD thesis has so far been completely unknown to me. His later works are also really hard to come by, but when it comes to his dissertation, it seems doubly hard to lay one’s hand on it…. It would be great to do that, especially as the work is on such an incredibly relevant topic as another commune (I discussed only one commune in my book, one set up by Eddie Madunagu). This is very, very relevant and I hope to investigate the issue further!! – Thanks! –Focusing more on ‘legal’ Marxists has not at all been a conscious choice though on my part, when putting together the material. Indeed Comrade Olamosu is absolutely right that exactly the illegal ones often represented more genuinely emancipatory trends than the ‘legals.’ However, strict illegality, especially after the Adebiyi Tribunal or under Abacha, did not favour theorizing: I could not, after all, discuss works that did not see the light under those regimes. –Regarding African Marxist systems: I do not in the book discuss their revolutionary credentials. In fact many of them were much more revolutionary than the conservative, lukewarm, Brezhnevian USSR that helped them internationally. (I do question the revolutionary credentials of ‘African socialisms’ but that is of course another group of countries/leaders/thinkers.) I also do agree that some of the ‘rot’ from within the USSR, originated directly in the CPSU. –That said, it might be problematic to assert that the ‘rot’ started with, or just after, 1917 (even though Lenin himself assigned the unions a new, non-independent, role: see an excellent discussion of this in Tamas Krausz’s magnificent recent book on Lenin). In a similar vein, it might be somewhat ahistorical to lump together Khrushchev’s optimistic era with Stalin’s time, or with the dread of the early Brezhnev years. There was after all, enough revolutionary spirit in Gorbachev’s Soviet Union still, to secretly aid striking British workers and various Nigerian socialist formations, or to invite Madunagu to Moscow – which is of course not to say that there was no degeneration but what degenerated was a workers’ state, and the process was a dynamic one. –Thanks again for this excellent interview with a very brave Marxist revolutionary and indeed, a role model within the movement, Abiodun Olamosu! My appreciation Comrade Adam Mayer for your kind comment. I must confess that your new book fascinated me than my comment on it could fulfill within the interview for reason of limited space. Beyond the main theme of the book the story of the evolution of Nigeria and the Left is an eye opener that is going to make tremedious impacts on the reading public. Omafume Onoge thesis I am aware is in the custody of Biodun Jeyifo who made a copy of it from the archive of Harvard University where he is teaching and also Onoge’s alma mata. I learnt he is looking for a publisher for this. While I am in agreement with some of your positions on Russia but there are still certain area of disagreement which would need to be spelt out. Typical of this is the characterisation of the nature of the state in the former USSR. I will like to lend my support on the side of those that believe that what took place there before the collapse of 1989 was state capitalism as against Leon Trotsky seen it as a degenerated workers’ state. Apart from Tony Cliff and Chris Harman known to have led discussion in favour of the former trend, Lenin also confirms as much as far back as 1918 and thereafter that the practice in Russia was state capitalist in nature (see Lenin Collected Works, Vol 27, Progress Publishers; pp. 281-305 and 329-342). The major difference between Lenin and the Stalinists that came later was that Lenin did not hide what the situation was and this he hinged on the objective condition of an underdevelopment of Russia that was predominated by petty-bourgeoisies and therefore state capitalism became inevitable as a temporary measure to instill discipline and enforce control as well as accountability by the young revolutionary government for it to move forward in advancing to socialist state in the coming period. Stalinists on their part see this as a permanent phenomenon. I do not also share the idea that Gorbachev was better than the rest of other Stalinists and bureaucrats in Russia whatever might be differences in forms but they were not fundamental in departing from the path of Stalinism. The collapse experienced in 1989 was also a confirmation of her level of degeneration far from the expection of Trotsky that political revolution could still take place to address misdemenours caused. In our situation here in Nigeria I learnt of how books stocked in Russia Embassy comprising of science and technical books, collected works of Lenin, Gorki, Marx, Engels, Plekhanov, etc were directed to be put aflame. Those were reduced to ashes on the excuse of glasnot and perestroika. Nevertheless, there is no doubt that in one way or the other the Stalinist regimes in Russia and elsewhere provided certain helping hands to their sympathisers or supporters in the trade unions or left intellectuals and this was not restricted to Gorbachev. Dear Comrade Olamosu, Thank you for your incredibly kindly take on Naija Marxisms again!! It is fantastic to discuss here with you on these matters. Thank you specifically also for your ideas on how to reach Onoge’s dissertation. I will deifnitely give this link a try and again, let me state how grateful I am for your drawing my attention to the existance of this dissertation in the first place!! —I would like to respectfully challenge the notion (as widely accepted as it is) that the USSR was state capitalist. Lenin of course did inititate the NEP and he was honest about what he was doing even prior to that, but it would be wrong to judge the economic system of the USSR based on an analysis (however accurate) of the situation in 1918. If we assert that the USSR was ‘state capitalist’ in say, 1963, then what kind of terminology should we use for the economic system of India at the same time? Why then, do we talk about the introduction of the market and elements of state capitalism in the PRC after Mao’s death? —Your point on the Russian Embassy burning books by Lenin, Marx, Plekhanov, and even Gorkiy — this is revolting and again, let me emphasize how for me this is new information!!! Sorry to ‘use’ your vast knowledge on these issues but the relevance here is so obvious again that I feel that I must ask for some kind of source (if at all possible!!!). —That said, independent Russia, I have to point out, already was ‘an independent country’ in IR terms and most especially independent from Gorbachev who, days after the dissolution of the USSR by three of its constituent republics, publicly acquiesced to the fact and resigned. The Embassy of the Russian Federation represented Yeltsin’s government, not Gorbachev’s., and thus a government that was both nationalist and expressedly anti-Marxist. —Gorbachev of course was no knight in shining armour. In the former USSR, people regard him partly as a fool (in the ‘realist’, Machiavellian sense), partly as an incredibly inefficient leader who spent years on useless projects (such as the ‘dry law’ 1985-1987, the lack of coherence in both glasnost and perestroika etc). However, it might be problematic to accuse exactly him, who genuinely wished for increased democratisation in the Lukacsian sense (especially prior to 1990/1991 when he would turn unabashedly capitalis), and who talked of nothing as much as of the ‘return to Lenin’, a friend of ‘intellectuals’ – to call this man exactly, a Stalinist. —There are ultranationalists in Russia today who assert that ‘the worst feautre of Stalinist bureacratism was that it produced in the end someone like Gorbachev’ but this is neo-imperialist analysis (I would think), and not necessarily a Marxian analysis! —One more thing should be said about Gorbachev, and that was his introduction of some (rudimentary) Human Rights concepts, dismissed even by Lenin himself as bourgeois theatre, to socialist discourse and to Soviet legislation. —Again, Comrade Olamosu, let me honestly thank you for your answer and your very, very important points! Looking forward to your answer, In solidarity! Thank you for this wonderful interview and the interesting comments that followed. As a student I read Olamosu and recently found it in my collection as I was searching for materials for my dissertation. I am happy that these conversations are live and well, and though I do not know much about the history of socialism and Marxism, I am very much interested in what a socialist alternative will look like in Nigeria. I find a lot of older material, mostly which precedes 1999, so it is good to have these resources for more recent materials. If you would be so kind, Comrade Olamosu, to suggest other more recent work, that would be much appreciated. I have already requested the Mayer book from the library and look forward to reading it.